At Boston University we’re serious about learning. That’s why we’re ranked #32 among the top 500 global universities by U.S. News & World Report. Boston University is a 2.1-kilometer-long campus located along Commonwealth Avenue, next to the historic Charles River. Boston is the capital of the state of Massachusetts and a hub for the fields of medicine, biotechnology, financial services, and the sciences. Financial Aid: Boston University does not offer need-based aid to international students. However, two highly competitive merit scholarships—the Trustee Scholarship and the Presidential Scholarship—are available to international students with exceptional academic records. Visit bu.edu/admissions/apply/international/scholarships-for-international-students for more information. At Boston University, we’re serious about learning. That’s why we’re ranked #39 among the “Best Global Universities” by U.S. News & World Report. Classes are challenging, and you will study with distinguished faculty such as Fulbright Scholars, a MacArthur Fellow, Pulitzer Prize winners, and a former Poet Laureate. You can select from more than 250 programs of study, including top-ranked programs in Biomedical Engineering, Business, Economics, Pre-law, and Pre-medicine. As early as your freshman year, you can become involved in cutting-edge research with faculty mentors through the Undergraduate Research Opportunities Program (UROP). With 10 undergraduate schools and colleges, plus opportunities to combine your interests through the Dual Degree Program, you’ll have countless ways to enhance your studies at BU. • The Arvind and Chandan Nandlal Kilachand Honors College is a program designed for the highest-achieving, most creative, and most intellectually curious students. In a small communal atmosphere, you’ll explore pressing global, societal, corporate, and geopolitical challenges while simultaneously pursuing your chosen major in your school or college. Opportunities for close interaction with faculty and innovative cocurricular events are hallmarks of the program. • The Seven-Year Accelerated Medical Program allows select students to complete their bachelor’s degree and medical doctorate in just seven years at the Boston University School of Medicine. Admission to the program is highly competitive. • The BU Dual Degree Program allows students to select majors at two BU schools or colleges. Examples include Business Administration (Questrom) and Economics (CAS) or Biomedical Engineering (ENG) and Computer Science (CAS). • Through the Double Degree Program, ambitious students can earn two bachelor’s degrees in select majors from the Wheelock College of Education & Human Development/College of Arts & Sciences or the College of Fine Arts/College of Arts & Sciences. Your classmates will come from all 50 states and more than 100 countries, and their unique experiences will challenge your perspectives both inside and outside the classroom. The Frederick S. Pardee School of Global Studies within the College of Arts & Sciences combines interdisciplinary studies and research opportunities across five globally focused majors, including International Relations. Plus, there are nearly 650 global courses to choose from across the University and more than 1,100 foreign nationals from 90+ countries teaching and researching here. With a premier study abroad program in the United States, offering more than 100 opportunities and 4,000 worldwide internship opportunities, you’ll have many chances to enrich your studies through a global experience. 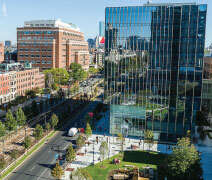 Boston is one of the top three destinations in the United States for international students. In fact, about 24% of the Class of 2022 comprises international students. 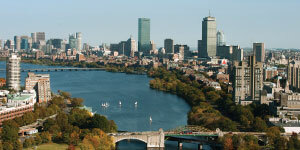 Our campus is located in the heart of Boston, along the historic Charles River. With guaranteed housing on campus all four years, you’ll become part of a tight-knit residential community. With more than 450 student organizations on campus, you’ll have endless ways to connect with new friends or celebrate your culture. You will have access to museums, the historic Freedom and African American Heritage Trails, Fenway Park, and the vibrant artistic, music, and literary venues across the city. 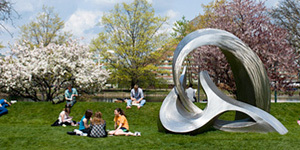 Boston also offers valuable connections between your course work and the community. You can participate in countless clinical and research projects or intern with one of the many leading financial corporations, biotech firms, or media outlets here. Why choose a research university? BU is one of only three research universities in Boston and Cambridge named to the prestigious Association of American Universities (AAU). For our students, this distinction means more than labs and data-crunching. Whatever your interest, you can explore it through research. It might be designing manufacturing equipment for New Balance in the Engineering Product Innovation Center, conducting field work alongside your Natural Sciences professor for the National Science Foundation, or performing on stage with the Boston Symphony Orchestra. AAU member institutions are also recognized for their extraordinary faculty. Simply put, you’ll be taught by distinguished faculty who will astonish you—in any field you choose. There are more than 2,000 labs on the Charles River and Medical Campuses, nearly 100 centers and institutes for research, and $400 million in research awards last year alone. That’s a lot of dedication to finding the answers to today’s most pressing questions. Did you know BU alumni live and work in 189 of the world’s 196 countries? Our Alumni Career Advisory Network keeps graduates around the world connected for professional success. That’s why 91% of recent graduates found employment or placements in fellowships, graduate programs, or the military within six months of graduation. In fact, a BU degree is so globally recognized that CEOs and recruiters ranked BU graduates #6 worldwide for employability. Wherever you decide to go after graduation from BU, you’ll have bright career prospects. You are eligible to apply for undergraduate admission to BU if you have completed the equivalent of an American secondary school education and have a diploma or satisfactory results on leaving examinations. To apply, you must use the Common Application. BU requires all international students to meet English-language proficiency requirements if English is not your first language or the primary language spoken in your home. For more information on applying for admission, including standardized tests and advanced credit, visit bu.edu/admissions/international. International students are eligible to apply for the Boston University merit scholarships described below. Typically, students who receive BU scholarships are in the top 5%–10% of their class. • The Trustee Scholarship is a four-year full-tuition merit award. Students must submit two additional essays. The deadline to apply is December 1. • The Presidential Scholarship is a $20,000 tuition scholarship renewable for up to four years of study. Students must submit their admission application by December 1 to be automatically considered for the scholarship.